This “pro. eight foot” Brunswick Contempa has been around since the 1960’s. Our customer used to play on it when he was a kid. He recently started helping his mother clean up his childhood home, he decided to keep the pool table he loved so much as a kid. He hired us to move this soon to be “newfound treasure” to his home in Orange, CA. 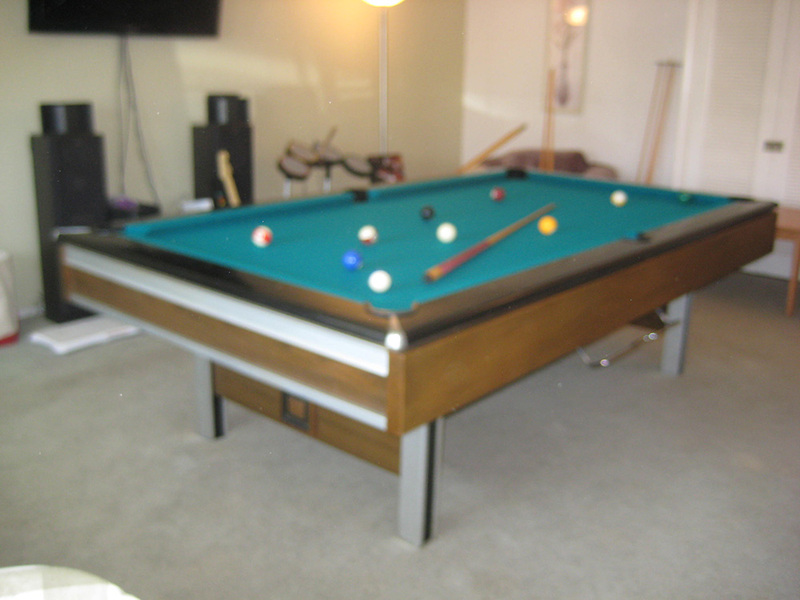 We were originally just hired to disassemble, move and setup the pool table, but as soon as my customer and I saw the condition of the felt we both knew it was the perfect opportunity to refelt the pool table after we moved it into his home. Upon further inspection I noticed that this 40+ year old pool table still had the original Brunswick “superspeed” cushions on it. Which, by the way were still good and “bouncy”. So, some 40 years later, in a new home, with a new standard green felt “face lift” this Brunswick pool table will now be enjoyed by my customer’s family and friends for hopefully another 40 years. Apologies for the blurry photo, the camera was dropped.